Kay's Adaptable Adventures: Nature's Sleep March Madness Sale! Believe you me folks, if I could afford a comfy new bed, I'd be ALL over that indulgence! My current bed that I've been sleeping on was bought at least 10+ years ago and if it's possible for beds to lose their comfy-ness, then I think I'm self diagnosing my bed with old age! Being part of the Nature's Sleep crew, I get the inside scoop on all the newest happenings including some pretty amazing sales. Since we've hit the month of March not too long ago, it's only appropriate to have a March Madness Sale! 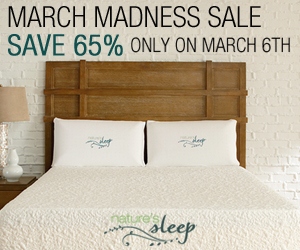 Springtime is here and Nature's Sleep is celebrating with a March Madness Sale! Everything in their site is 65% off, for your entire purchase. Note that this sale only lasts today, March 6th. We don't want to miss this dozy of a sale do we?! Disclaimer: I was not provided any compensation for the above post. All opinions expressed above are 100% mine and mine alone unless otherwise stated. I'm apart of the Nature's Sleep Blogger Program and receive event and sale information to share with my fans and readers.